Tekashi69 has been pictured for the first time in jail, in an Instagram post shared by his girlfriend yesterday (January 7). The rapper, whose real name is Daniel Hernandez, was indicted on six federal charges on November 19 at Manhattan Federal Court, including discharging a firearm while committing a crime and assault with a dangerous weapon. 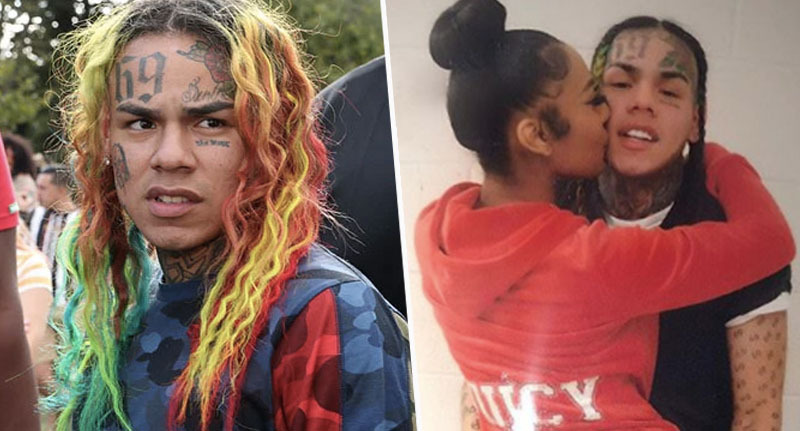 Though despite facing these charges (and a minimum of 32 years in prison), 6ix9ine was looking surprisingly chipper in the ‘loving’ photo shared by his girlfriend. The picture shows the couple getting quite hands on with each other, with the 22-year-old rapper grabbing his girlfriend Jade’s bum, TMZ report. As he does this – while looking quite pleased with himself, might I add – Jade wraps her arms around his neck and gives him a kiss on the cheek. Tekashi is wearing a black uniform, issued by the jail, with a white t-shirt underneath while Jade wears a red tracksuit with the word ‘juicy’ on the back. Ah, love’s young dream. Jade made sure that her followers were kept up to date on her boyfriend’s well-being, captioning the picture: ‘He’s good luv , enjoy’, followed by a wink face emoji and a red love heart. 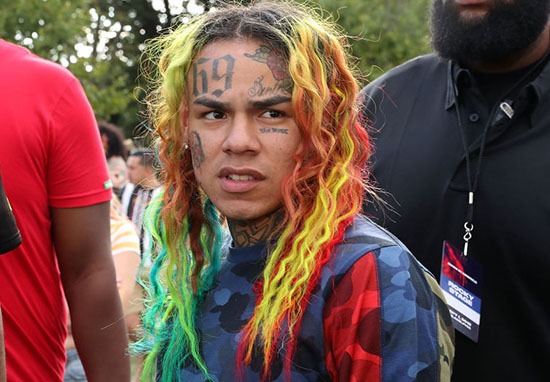 The caption ended with a rainbow emoji, making reference to Tekashi’s colourful hair, which appears to have faded slightly during the rapper’s time in prison. Not to worry though, because Jade did dye her own hair an assortment of colours for a short period of time – presumably to support her man. She also got a tattoo on her chest which reads simply ’69’. I know it’s a homage to Tekashi but c’mon, could she not have just had a love heart inked on her or something? Sigh. Posting to Instagram (again) in December, she wrote alongside a picture of her newly dyed locks, ‘NO PRENUP WE #1 STOOPID’. But it seems she’s back to her natural brunette now as the picture with Tekashi shows her sporting a brown bun while she hugs her man. It is not known how long Hernandez will be in prison for but the charges he faces could lead to a lengthy jail spell for the rapper; the most serious of the charges is the discharging of a firearm while committing a crime. This is punishable with a mandatory minimum of 25 years in prison, and could potentially carry a life sentence for the 22-year-old. TMZ report that 6ix9ine was arrested on November 18 by Agents of the Bureau of Alcohol, Tobacco, Firearms and Explosives (ATF) in New York City. Hernandez has pleaded not guilty to all charges and a trial date has been set for September 4 next year. The rapper was denied bail, despite his attorney Lance Lazzaro offering to pay the court $750k – as well as the promise that Daniel would surrender his passport and remain on house arrest. As such Tekashi is expected to remain behind bars while he awaits trial. If he’s found guilty the rapper will face a minimum of 32 years to life imprisonment.